After so many packs we again have a new pack which will convert your old, boring Windows 7 look to a new amazing Mac OSX Mountain Lion Look. 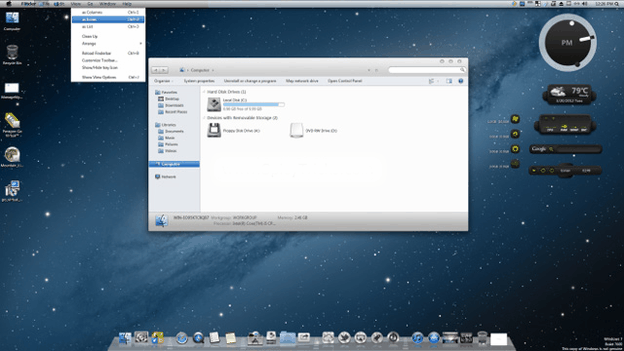 The pack customizes every single thing and you get an exact look of Macintosh operating system on Windows. You may be interested in our earlier packs to, Mac Lion Skin Pack, Android like look, Gnome Pack for Linux like look, Mango Skin Pack , Windows 8 Pack, Mac OS Pack and Xbox 360 pack. Note Keep in mind that these packs are easy to install but are very difficult to uninstall. So make a restore point before installing these packs, so that if you don’t like the new look you can revert it back. If the pack fails to install, try to disable user accounts.